WASHINGTON — The Pentagon is poised to send at least 2,000 more active-duty troops to the southwestern border, Defense Department officials said Tuesday, deployments that have already cost the military hundreds of millions of dollars and thrust the department into the center of the debate over border security and President Trump’s proposed wall. 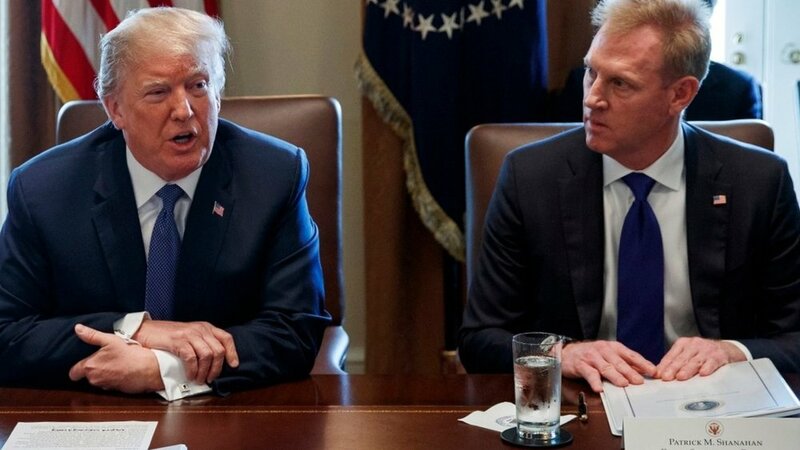 The acting defense secretary, Patrick Shanahan, told reporters that the United States would be sending “several thousand” additional troops to provide more support for the Department of Homeland Security’s border patrol efforts. Defense Department officials later said that they expect that number to be around 2,000. That would come on top of the 2,400 troops who are there now, bringing the deployed number at the border close to the high of 5,900 that it reached in the weeks surrounding the midterm elections in November. As far as I can tell, this order came out of nowhere on Tuesday while I was reflecting on the immigrant rights march in Santa Fe. The first time Trump ordered troops to the border last fall, it fed into his narrative that the U.S. was threatened by the impending “invasion” of a caravan of Central Americans (families who were slowly walking their way north through Mexico to eventually apply for asylum in the U.S., and had banded together for protection along the treacherous journey). It’s illegal for the armed forces to perform law enforcement activities like, say apprehending people who cross the border illegally, so their actual responsibilities were extremely limited once they were deployed. But this was the run-up to the midterm elections, and Republican candidates were hammering immigration policy and border security in their campaigns. Deploying troops provided the drama and visuals those candidates needed to stir up fear. In short, the move seemed like a cheap political stunt—or rather, an expensive one. This time around, troops still won’t be allowed to provide more than limited support to Border Patrol operations on the ground. So, it’s still more stunt than anything. The question is, why now? My immediate speculation is that the Trump administration faced a lot of backlash from right-wing media when he agreed to reopen the government last Friday after a record-setting 35-day partial shutdown. Fox pundits and vitriolic radio commentators wanted him to hold out for that $5.7 billion in wall funding, which the Democratic House refused to grant. Now he needs a quick and easy move that lets him claim he’s still tough on the issue of border security. When the executive branch can’t wrangle Congress to bend to its well, what action can it take unilaterally? Deploy troops. I’m sure there will be plenty more reporting over the next few weeks on the question of the troops, the wall, its funding, and whether or not the government will be shut down all over again come February 15, when the latest continuing resolution is set to expire. For now I’ll just say this about media coverage of the issue: journalists and news organizations based in Washington, New York, and other far-flung cities have a bad habit of referring to “the border” as a monolithic entity or a single spot on the map. It’s not. It’s 1,989 miles of diverse mountains, desert, and river. Where exactly along those miles are most migrants attempting to cross? Are the largest groups headed for urban ports of entry, remote stretches of desert, thin bands of river? How about cartel activity and drug smuggling—does that tend to happen in the same regions where would-be laborers or asylum-seekers approach the border? How about these troops—are they being sent to cities or desert or ranches? Are they all clumped together or evenly sprinkled along the border from coast to coast? Are they strategically positioned at places with high local cartel activity, or where migrant caravans are expected to approach—or neither? Maybe they’re just deployed to random federal lands for the sake of convenience and a photogenic backdrop. How is anyone supposed to have an informed conversation about what’s needed on the ground if we don’t even know whether various caravans, cartels, and troops end up within a thousand miles of each other once they each reach the vague “southwestern border”?